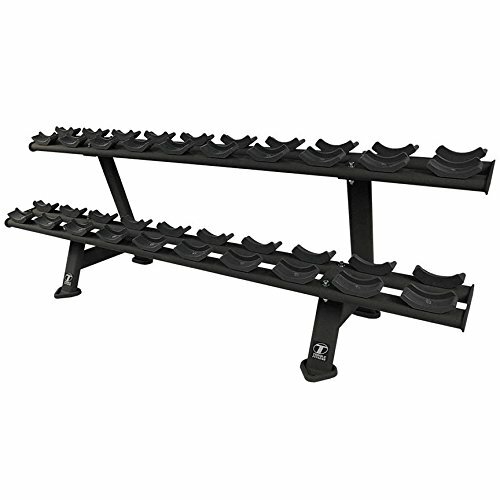 The X Series Commercial Two-Tier Dumbbell Rack (XTTDR) from Torque Fitness offers the ultimate in See, Feel, and Trust - Visual Impact, Ultimate Comfort, and Bullet Proofing where it counts! What Users See: A visual connection to X Series commercial gym equipment through aesthetic style, color, and upholstery, A strong, sculpted look that signals quality construction and performance, Extended "like new" look and feel through durable moldings and paint protection, Storage for 10 pairs of dumbbells. Includes numbers for each dumbbell increment location. 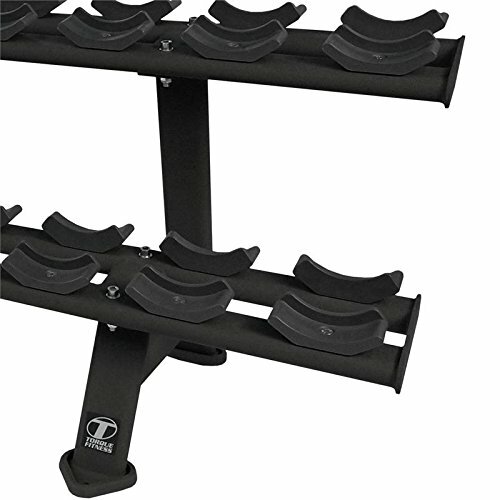 What Users Feel: Angled trays and offset trays for proper body position and comfortable wrist angle when removing and racking dumbbells, Nylon saddles feature concave lip that distributes contact evenly, prolonging dumbbell life, Solid stability through wide base plates on all floor contact points, Ultimate stability option through permanent floor anchoring capability. What Users Trust: Durable construction through 1-1/2" x 5-1/2" 11 gauge flat oval tubing, Nylon saddles prevent wear on dumbbells, Formed tray allows extra clearance for hands, A 30 year culture of long term durability and customer service. Dumbbells as shown in manufacturer stock photo are for demonstration purposes only and are NOT included. Colors: Black frame uprights and Black trays and saddles. 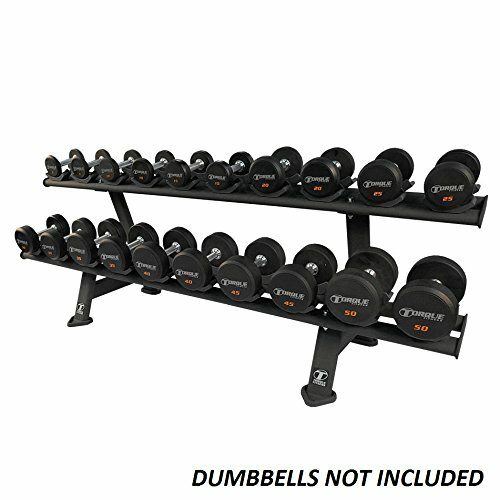 Holds 10 pairs of pro-style, round head, or solid head dumbbells. 11 gauge flat oval steel frame tubing. Nylon saddles prevent wear on dumbbells. Assembled Dimensions: 90.2" L x 29" W x 32.2" H (150 lbs). Commercial and Residential Warranty. Dumbbells NOT Included.